Detailed review of Designs for Health Probiotic Synergy. See how this probiotic supplement compares against all the others! Overall, at 3 out of 5 stars, Designs for Health Probiotic Synergy is a slightly above average probiotic. This probiotic is really easy to use. Simply take 1 sphere a day with a meal. Also, the spheres are much smaller than average and may be ideal if you have trouble swallowing big pills. This probiotic has 5 billion CFUs, which is an optimal cell count for daily use. I also like that I didn’t experience any side effects and they use turmeric for color instead of artificial color. What I don’t like is that this product has no sort of satisfaction or money back guarantee. The return policy is also not good, so this is a let down. The probiotic cells are only guaranteed until the time of manufacture. I like it better when the cells are guaranteed until the expiration date. This probiotic also should be refrigerated if you want the cells to remain at their optimal potency. Overall, at 3 out of 5 stars, Designs for Health Probiotic Synergy is a slightly above average probiotic because it has a great cell count for daily use, is easy to use, and has a unique tablet sphere design that’s easy to swallow, however the probiotic doesn’t have a satisfaction guarantee and the cells are only guaranteed at the time of manufacture. Probiotic Synergy has 5 billion CFUs in 8 different probiotic strains. This is the tried and true probiotic that has been researched quite extensively. Lactobacillus acidophilus has been researched to help relieve symptoms of Irritable Bowel Syndrome (IBS) such as gas, bloating, constipation, and diarrhea. This strain may also help boost immune function and help fight off vaginal infections. One strain in the line up that I’m not a fan of is Lactobacillus casei. This particular strain may actually be aggressive and overrun the other good probiotics in the body. This isn’t what we want! However, this strain may be able to help with constipation and diarrhea. Probiotic Synergy doesn’t seem to have any allergy concerns. There are no major allergens listed in the ingredients. The entire list of other ingredients includes: hydroxypropyl methylcellulose, pectin, microcrystalline cellulose, sodium carbonate, silica dioxide, vegetable stearate, guar gum, and turmeric (natural color). For a bottle of 60 probiotic spheres, a 2-month supply, it costs $37.90. This works out to be $0.63 per day to take these. A daily cost of $0.63 is right around average for a daily probiotic. I think Probiotic Synergy is a good value for the price. I didn’t experience any negative side effects while taking this probiotic. I was very happy about this! 5 billion CFUs is nice and gentle for a daily probiotic. Unfortunately, I couldn’t find any sort of satisfaction or money back guarantee on Designs for Health website. If you want to return the product it has to be unopened and returned within 30 days. You’re also charged a 10% restocking fee. I would’ve really liked to see some sort of guarantee with this product. 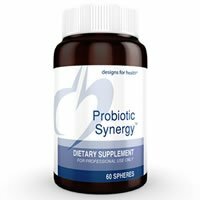 To buy Designs for Health Probiotic Synergy, click here. Side Effects I didn’t get any negative side effects while taking this probiotic.